Dribble Ons Bright Range has made a huge splash on the baby bib scene! 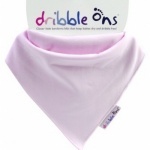 Now there a bandana bib to catch dribble of every colour! Dribble Ons draw away the moisture with the soft terry cotton lining, whilst being cute and comfortable to wear.